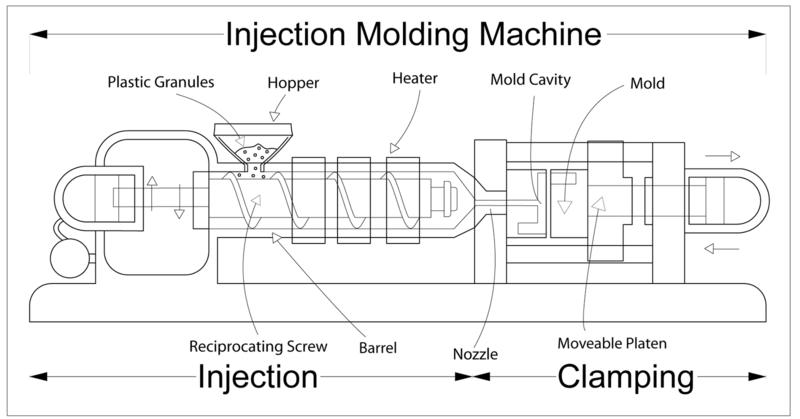 What exactly is injection moulding? Injection moulding BrE or Injection molding AmE, is a manufacturing process for producing parts by injecting material into a mould. Injection moulding can be performed with a host of materials mainly including metals, (for which the process is called die-casting), glasses, elastomers, confections, and most commonly thermoplastic and thermosetting polymers. Material for the part is fed into a heated barrel, mixed, and forced into a mould cavity, where it cools and hardens to the configuration of the cavity. After a product is designed, usually by an industrial designer or an engineer, moulds are made by a mould-maker (or toolmaker) from metal, usually either steel or aluminium, and precision-machined to form the features of the desired part. Injection moulding is widely used for manufacturing a variety of parts, from the smallest components to entire body panels of cars. Advances in 3D printingtechnology, using photopolymers which do not melt during the injection moulding of some lower temperature thermoplastics, can be used for some simple injection moulds. Injection moulding is used to create many things such as wire spools, packaging, bottle caps, automotive parts and components, gameboys, pocket combs, some musical instruments (and parts of them), one-piece chairs and small tables, storage containers, mechanical parts (including gears), and most other plastic products available today. Injection moulding is the most common modern method of manufacturing plastic parts; it is ideal for producing high volumes of the same object. KraussMaffei, which Assiplast has 30 years of service experience, is one of the worldwide leader of manufacturing injection molding machines. Injection moulding uses a ram or screw-type plunger (need screws or other spare parts? take a look at Assiplast Marketplace, or contact us directly) to force molten plastic material into a mould cavity; this solidifies into a shape that has conformed to the contour of the mould. It is most commonly used to process both thermoplastic and thermosetting polymers, with the volume used of the former being considerably higher. Thermoplastics are prevalent due to characteristics which make them highly suitable for injection moulding, such as the ease with which they may be recycled, their versatility allowing them to be used in a wide variety of applications, and their ability to soften and flow upon heating. Thermoplastics also have an element of safety over thermosets; if a thermosetting polymer is not ejected from the injection barrel in a timely manner, chemical crosslinking may occur causing the screw and check valves to seize and potentially damaging the injection moulding machine, in this case you can contact us, Assiplast knows for sure how to repair your machine. Injection moulding consists of high pressure injection of the raw material into a mould which shapes the polymer into the desired shape. Moulds can be of a single cavity or multiple cavities. In multiple cavity moulds, each cavity can be identical and form the same parts or can be unique and form multiple different geometries during a single cycle. Moulds are generally made from tool steels, but stainless steels and aluminium moulds are suitable for certain applications. Aluminium moulds typically are ill-suited for high volume production or parts with narrow dimensional tolerances, as they have inferior mechanical properties and are more prone to wear, damage, and deformation during the injection and clamping cycles; however, aluminium moulds are cost-effective in low-volume applications, as mould fabrication costs and time are considerably reduced. Many steel moulds are designed to process well over a million parts during their lifetime and can cost hundreds of thousands of euros to fabricate. When thermoplastics are moulded, typically pelletised raw material is fed through a hopper into a heated barrel with a reciprocating screw. Upon entrance to the barrel the temperature increases and the Van der Waals forces that resist relative flow of individual chains are weakened as a result of increased space between molecules at higher thermal energy states. This process reduces its viscosity, which enables the polymer to flow with the driving force of the injection unit. The screw delivers the raw material forward, mixes and homogenises the thermal and viscous distributions of the polymer, and reduces the required heating time by mechanically shearing the material and adding a significant amount of frictional heating to the polymer. The material feeds forward through a check valve and collects at the front of the screw into a volume known as a shot. A shot is the volume of material that is used to fill the mould cavity, compensate for shrinkage, and provide a cushion (approximately 10% of the total shot volume, which remains in the barrel and prevents the screw from bottoming out) to transfer pressure from the screw to the mould cavity. When enough material has gathered, the material is forced at high pressure and velocity into the part forming cavity. To prevent spikes in pressure, the process normally uses a transfer position corresponding to a 95–98% full cavity where the screw shifts from a constant velocity to a constant pressure control. Often injection times are well under 1 second. Once the screw reaches the transfer position the packing pressure is applied, which completes mould filling and compensates for thermal shrinkage, which is quite high for thermoplastics relative to many other materials. The packing pressure is applied until the gate (cavity entrance) solidifies. Due to its small size, the gate is normally the first place to solidify through its entire thickness. Once the gate solidifies, no more material can enter the cavity; accordingly, the screw reciprocates and acquires material for the next cycle while the material within the mould cools so that it can be ejected and be dimensionally stable. This cooling duration is dramatically reduced by the use of cooling lines circulating water or oil from an external temperature controller. Once the required temperature has been achieved, the mould opens and an array of pins, sleeves, strippers, etc. are driven forward to demould the article. Then, the mould closes and the process is repeated. For a two shot mould, two separate materials are incorporated into one part. This type of injection moulding is used to add a soft touch to knobs, to give a product multiple colours, to produce a part with multiple performance characteristics. For thermosets, typically two different chemical components are injected into the barrel. These components immediately begin irreversible chemical reactions which eventually crosslinks the material into a single connected network of molecules. As the chemical reaction occurs, the two fluid components permanently transform into a viscoelastic solid. Solidification in the injection barrel and screw can be problematic and have financial repercussions; therefore, minimising the thermoset curing within the barrel is vital. This typically means that the residence time and temperature of the chemical precursors are minimised in the injection unit. The residence time can be reduced by minimising the barrel’s volume capacity and by maximising the cycle times. These factors have led to the use of a thermally isolated, cold injection unit that injects the reacting chemicals into a thermally isolated hot mould, which increases the rate of chemical reactions and results in shorter time required to achieve a solidified thermoset component. After the part has solidified, valves close to isolate the injection system and chemical precursors, and the mould opens to eject the moulded parts. Then, the mould closes and the process repeats. A parting line, sprue, gate marks, and ejector pin marks are usually present on the final part. None of these features are typically desired, but are unavoidable due to the nature of the process. Gate marks occur at the gate which joins the melt-delivery channels (sprue and runner) to the part forming cavity. Parting line and ejector pin marks result from minute misalignments, wear, gaseous vents, clearances for adjacent parts in relative motion, and/or dimensional differences of the mating surfaces contacting the injected polymer. 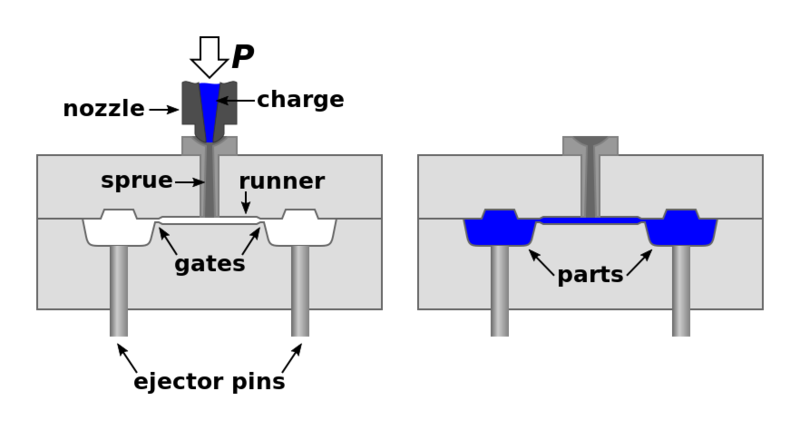 Dimensional differences can be attributed to non-uniform, pressure-induced deformation during injection, machining tolerances, and non-uniform thermal expansion and contraction of mould components, which experience rapid cycling during the injection, packing, cooling, and ejection phases of the process. Mould components are often designed with materials of various coefficients of thermal expansion. These factors cannot be simultaneously accounted for without astronomical increases in the cost of design, fabrication, processing, and quality monitoring. The skilful mould and part designer will position these aesthetic detriments in hidden areas if feasible. Traditionally, the injection portion of the moulding process was done at one constant pressure to fill and pack the cavity. This method, however, allowed for a large variation in dimensions from cycle-to-cycle. More commonly used now is scientific or decoupled moulding, a method pioneered by RJG Inc. In this the injection of the plastic is “decoupled” into stages to allow better control of part dimensions and more cycle-to-cycle (commonly called shot-to-shot in the industry) consistency. First the cavity is filled to approximately 98% full using velocity (speed) control. Although the pressure should be sufficient to allow for the desired speed, pressure limitations during this stage are undesirable. Once the cavity is 98% full, the machine switches from velocity control to pressure control, where the cavity is “packed out” at a constant pressure, where sufficient velocity to reach desired pressures is required. This allows part dimensions to be controlled to within thousandths of an inch or better. If you have questions about injection moulding process or in particular about Krauss Maffei machines feel free to contact us. 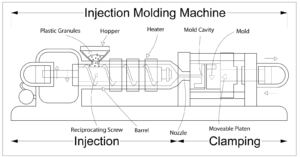 What is a injection molding machine?